I've known about the existence of Terra Pass for sometime. In a former life I spent most of my time writing about greener living, eating organic, and reducing toxins in our lifestyle. Sound familiar? I guess I regraduated to sharing these same sorts of topics for dogs, huh? No big mystery. In a few weeks I'll be traveling by air to watch my son receive his MBA. It's kind of a bummer that this will occur on the same weekend that Blogpaws convenes, but family is first for this green gal. And while I'm flying--burning all that jet fuel--I am heading to William and Mary in the knowledge that I have done my part to support the carbon offset projects created by Terra Pass, fighting climate change and reducing my carbon footprint. You're probably thinking this was an expensive offset to purchase, right? The surprise was on both of us. While purchasing my tickets from Expedia.com, I was offered the opportunity to buy these offsets for each of the passengers--family members. I jumped at the chance to try it and was thrilled to find that the cost was lower than I ever imagined. For well under $10 per person, I was able to course correct for the the damage our flights cause to our air quality and the environment as a whole. So we're all traveling with a Terra Pass certificate and feeling really green--even Oliver! Give it a try when you book your next trip. What's more, you don't even have to be traveling to do your part. You can purchase a year's worth of carbon footprint correction for your kitchen emissions here, or you can give the gift of a cleaner environment by purchasing an offset as a gift. Who knew?!!! While learning more about Terra Pass online, I discovered a Conference Carbon Footprint Calculator on their site. I'll bet Blogpaws or Global Pet Expo would find this very interesting. Fascinating stuff for travelers who want to know how their journey affects the environment, and more importantly, what they can do about it. So Oliver and I are off soon to enjoy family graduations--more than one actually. Shortly after my son earns his MBA as Valedictorian of his class, my daughter-in-law will make us equally proud as she earns her Juris Doctor in preparation for a career as an Attorney and Guardian ad Litem. I'm beaming with pride as I think of them all. Let's celebrate! In honor of graduations, Terra Pass carbon offsets and Doga instruction, let's give away some water bottles to help preserve the environment in another way. You won't need bottled water for your Doga workout when you've got a refillable water bottle to stay hydrated with as you practice. Enter below and enjoy your journey to live just a little lighter on Earth. Psst--Don't see the giveaway widget down there? It's just taking a nap on the Yoga mat. 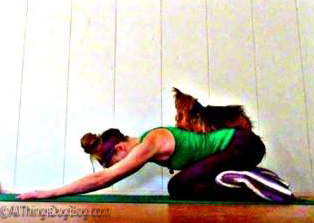 Click on the post title and it will reappear ready to help you win a Doga water bottle for your practice. Good luck! I take my own bags when I go to the grocery store. Not only do I get $0.05 for each bag but I keep a plastic bag out of a landfill. I will say what my yoga instructor said to me the first time, do not do anything that hurts. You should feel stretching but not pain. @Danielle Murgia: Your yoga instructor gave excellent advice. Glad to hear you're using reusable grocery bags. You get today's #EcoPetParent award! I recycle everything I can and it saves me on my garbage bill. My grandfather actually did not pay for garbage service because he was able to recycle, reuse and compost everything! We recycle. Our school is saving bottle caps so we can make a bench for our school. We recycle at school too! Thanks, @Jenna Z, for the nice example of a partner pose. Oliver and I have not worked in this way yet, but I'm hopeful that we'll get there! After I clean the cat litter box, I keep using the bag to clean up dog poop in the yard for a day or two. The cat litter waste in the bag keeps the bag from getting too stinky. I use food bags, such as the kind that have frozen food in them inside a box, to pick up poop rather than just throwing them away. If there is any food crumbs, I just rinse them. I bring my own cloth bags to the store and also recycle. I use the plastic bags I get at the grocery for picking up dog poop and try to buy treats and toys in the least packaging and/or recyclable packaging. I make my own pet toys with leftover craft supplies & upcycled fabric.